Check out the Jane Cosmetics Lip Gloss in the Color, "Passion" This is a sheer but light red, perfect for any occasion. I wore this on the fourth of July and my lips stayed soft and shiny the entire night. (Of course I applied the gloss a few times) but it also works well over any lipstick or liquid lipstick. 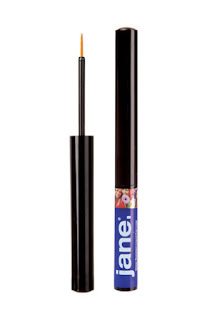 And last but not least, compliment your patriotic look by defining eyes with Jane’s Water Resistant Liquid Eye Liner in Navy for the perfect color-blocking cat eye. Feeling extra festive? Use the Water Resistant Eye Liner to fill in brows. Now personally I wouldn't put this color in my brows, but I saw crazier then that on 4th of July. Yes Fourth of July has passed, but I had a total blast, and I hope you all had fun and stayed safe too. This is a great look for ANY day of the week, I'm completely obsessed with the Liquid Liner, mostly because the Navy color makes my blue eyes pop. I am certain when I run out I will be purchasing it again; plus the price tag makes it that much more easy to fall in love with.